This should be Hassocks' last trip to Broadbridge Heath Leisure Centre and the Robins won't be too displeased about that after they suffered a 6-0 defeat at the hands of Steve Painter's high flying Bears. Heath's new High Wood Sports Ground is nearing completion with the latest update a month ago revealing that the perimeter path, the foundations for the stands and the floodlight bases were all in place with the lights installed within the next week or two. They'll move into the purpose build facility on a high. This victory lifted Heath into seventh in the table, leaving them well on course to equal their best ever Premier Division finish if they can maintain that position come the end of the campaign. Hassocks meanwhile seem to be heading in the opposite direction. They've won just two of their last eight league games with only goal difference keeping them out of the relegation zone and face a devilishly difficult looking run of games with title challengers Pagham, Horsham YMCA and Eastbourne Town all to come in their next five fixtures. That sort of form will raise serious concerns about whether the Robins will even be in the same division as Heath next season to visit the Bears' new ground. Of the sides below them, Loxwood have appointed a new manager and Eastbourne United have a new chairman with seemingly an increased playing budget as a result. Should those changes lead to turnaround for both those sides, Hassocks will be looking nervously over their shoulder. Mark Dalgleish did at least have the excuse of a threadbare squad for this heavy defeat. Missing were first choice full backs Harvey Blake and Jordan Badger, midfielders Spencer Slaughter, Matt Berridge and Alex Spinks and top scorer Phil Johnson. The Robins also faced a selection crisis in goal, which meant a debut for 16-year-old youth team goalkeeper Toby Fisher. Although he may have conceded six times, Fisher was outstanding and without several of his interventions, the scoreline could have been even more brutal. Fisher's inclusion made him the 100th youth team player to progress to the first team since Hassocks set up their under 18s side in 1991, a fantastic achievement for all those involved at the Beacon below senior level over the last 27 years. 10 of the Robins' 14-man squad at the Leisure Centre had played youth team football for the Robins. Other than Fisher's heroics, this was largely an afternoon to forget for Hassocks. 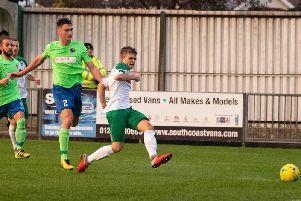 The only other positives that Dalgleish could take were the return after two months on the sidelines for Jack Wilkins who had an extended run from the substitutes bench, young Joe Bull put in another encouraging performance on a rare start at left back and Will Broomfield showing his versatility by stepping into midfield from his usual defensive berth. After an impeccably observed two minutes silence ahead of Remembrance Sunday, Hassocks found themselves coming into the break 4-0 down. Oliver Moore scored twice inside of the first 25 minutes to go with goals in the 36th minute from George Cousins and a 42nd minute effort from Thomas Howard-Bold. The Robins did improve slightly in the second half, only conceding a further two. Max Howell netted goal number five in 55 minutes with Dean Wright rounding off the scoring with seven minutes remaining. Hassocks: Fisher; Common, Jacques, Mills, Bull; Stokes, Broomfield, Ford; Littlejohn, Benson, Lindsey.